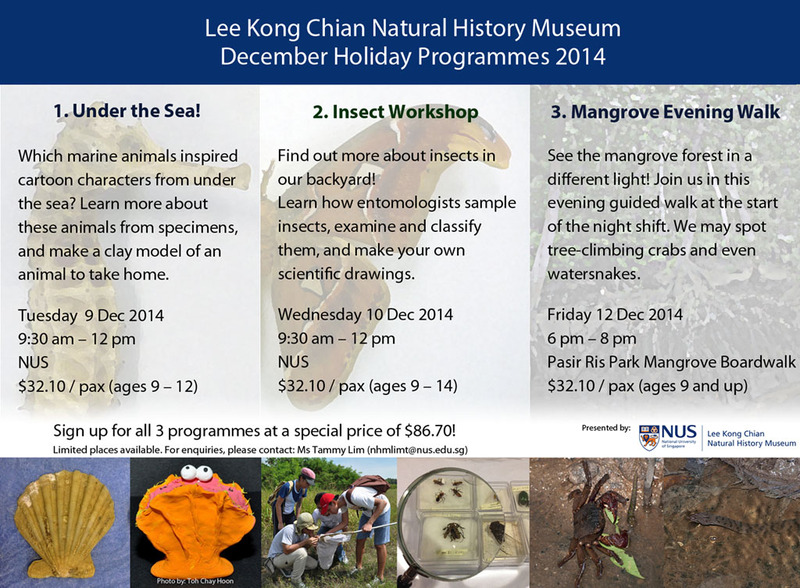 Learn about biodiversity and natural history with us this December holiday! Limited places are available. To sign up or find out more, please contact: Ms Tammy Lim (nhmlimt@nus.edu.sg). Who lives in a pineapple under the sea? Which fairytale princess traded in her tail for legs? Many of the characters from children’s shows are inspired by marine animals that can be found in Singapore’s waters. In this workshop, you will be able to get up close and personal with specimens of the animals that these characters are based on! Learn more about the characteristics and behaviour of a diversity of local marine animals and learn to distinguish fact from fiction about your favourite characters! Also, create and take home your own clay model of an animal from the workshop. We’re shore you’ll have a whale of a time! Do you know that not all insects are bugs? So what then is a true bug? Come join us, and find out more about the insect diversity we have in our backyard! Don’t miss this chance to go outdoors to sample insects with sweep nets, look at their tiny features through a microscope, and learn to make scientific drawings like an entomologist. We’ll also teach you how to identify the various insects so such questions will never bug you again! Join us for an evening walk in the mangroves to see this charming habitat in a different light. We will share with you stories about how life in the occasionally flooded forest is rich, but a constant challenge. Animals of night would be starting their shift, and we can see tree-climbing crabs and mudskippers, with a chance to spot watersnakes and fireflies! Sign up for all 3 programmes at a special price of $86.70 (U.P. $96.30)! Registration ends 3 Dec 2014.